So if life dropped hundreds of lemons into your yard, what would you make? Once when the Accidental Locavore was out in Palm Springs, a huge branch, full of lemons, from the backyard tree landed on the patio. 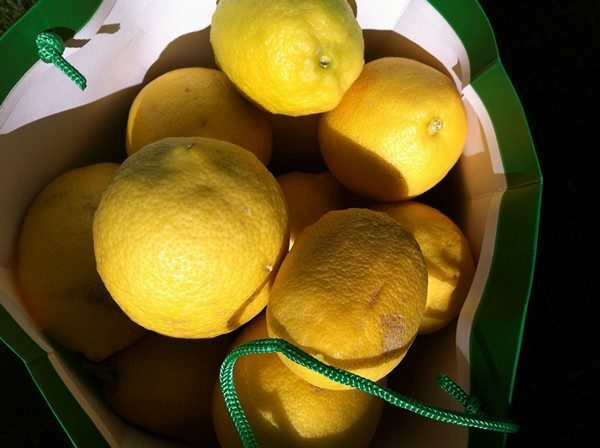 We picked two big shopping bags of lemons before the branch got cut down, but what to do with them? I tossed a few in my carry-on and brought them home, originally thinking of making lemon curd. After meeting Paula Wolfort and reading The Food of Morocco, I decided to go the full-on preserved lemon route. It’s super-simple, you just need to have time to let them develop. Soften the lemons by rolling them back and forth. Quarter them from the tops to within ¼” of their bottoms. Sprinkle salt on the exposed flesh and reshape the lemons. Pack them into a glass jar, pushing them down and adding more salt between the layers. 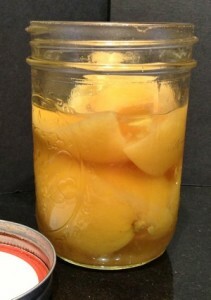 Top off with the lemon juice, but leave some air space before sealing the jar. Keep the lemons in a warm place for 30 days, occasionally turning the jar upside down to redistribute the lemon juice and salt. If necessary, add more lemon juice to keep the lemons covered. They’ll keep for a year in the refrigerator. Rinse before using, serve and enjoy! I always have a jar of the traditional ones in my fridge and since they were running low, I bought a bunch of regular lemons, ready to go for the 30 days until the roasted (2.0) recipe crossed my path. Since I had a batch of apricots dehydrating in the oven, tossing the lemons in only made sense. Preheat the oven to 200°. Slice the lemons lengthwise into 6 wedges per lemon. 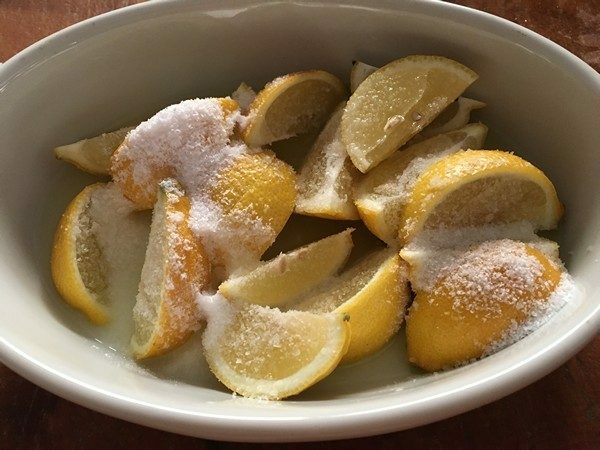 In an 8” ovenproof baking dish, toss the lemons with the salt. Add the lemon juice and cover tightly with aluminum foil. Bake for about 3 hours until the peels are tender. Cool before using. My verdict: Remember that either way, you need a few extra lemons for the juice. If you have access to Meyer lemons, both recipes recommend that you use them. Being on the wrong coast…The traditional ones have had about six months in the fridge and are exactly what you would think of as a preserved lemon with that slightly funky taste and still good citrus. The 2.0 roasted ones were very different—much fresher and more like a straight-up lemon. It will be interesting to see how they develop. 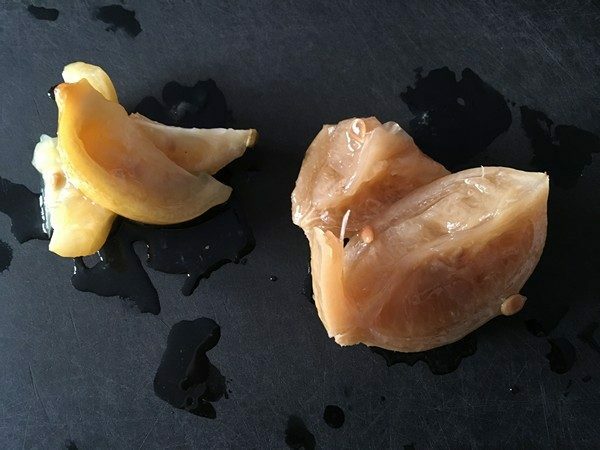 My real verdict is that if you’re not sure if you’ll like them, or don’t have 30 days, go for the roasted ones (you might even try tossing the dish onto the corner of a slow grill), but you can always buy a lot of lemons and try both! If you want suggestions for using them, check out the June Food & Wine, or finely chop the rind and use it in salad dressing or try them in anything savory in place of (or in addition to) regular lemons. For 2011 the Accidental Locavore has decided to start a cook-along, going through the shelves of cookbooks and actually cooking from the recipes. Join in and help to decide which books stay and which are deaccessioned. 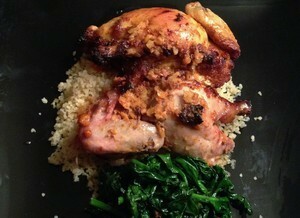 This week; a tagine of chicken from Claudia Rodin’s Arabesque, with recipes from Morocco, Turkey and Lebanon. What you see here is adapted from the book with changes made while cooking. The recipe says it serves 4 but you could easily stretch it to 6 with a grain and a vegetable side dish. 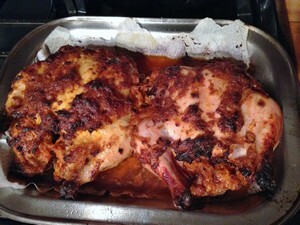 It’s an easy dish, the only thing that takes time is cooking the chicken, and reducing the sauce. In a wide casserole or heavy bottomed pan that can hold all the chicken in one layer, heat the olive oil and add the onions. Saute over medium low heat until they are soft, then add the garlic, saffron, ginger and stir to mix. Add the chicken pieces, season liberally with salt and pepper, and add 1 1/4 cups of water. Bring to a simmer and cover. Cook for 40 minutes, turning the chicken pieces a couple of times. Stir into the pan the lemon juice, the chopped coriander, parsley, the preserved lemon peel, and the olives. If you’re using artichoke hearts, add them now. Simmer 10 minutes uncovered until the sauce is thick. If the sauce isn’t thick enough (and mine wasn’t), remove the chicken from the pan, turn up the heat, and reduce the sauce until it’s at the desired consistency. Return the chicken to the pan, and let it heat through. 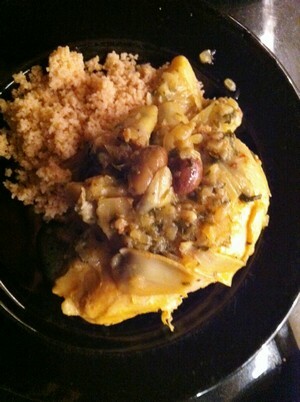 Serve over couscous to absorb the sauce, and enjoy. Frank’s rating: 3 1/2 stars: “Good but not great”. What did you think? Keep the book or deaccession? 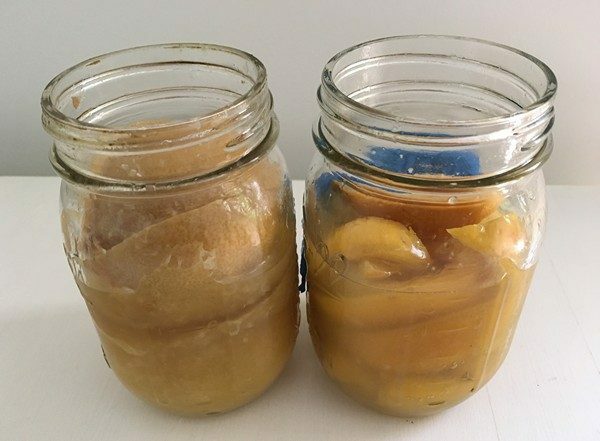 It’s really easy to make your own preserved lemons, you just cut them up and cover them with salt and a little lemon juice and let them sit in the fridge.You can make more, just double or triple the ingredients. Scrub the lemons well and dry them. Cut them into 8 wedges. Toss with the salt and put in a glass jar (canning jars are good here). Pour in the lemon juice. Close the jar tightly and let the lemons sit at room temperature for 7 days, shaking the jar daily to distribute the salt and juice. They will keep in the refrigerator for up to six months. Be sure to rinse them well before using.